There are mixed ideas about whether it’s best hot or cold. We like it both ways. I have to admit warm is more comforting to me but J prefers it cold. So, we compromise. The first piece we have is warm and the rest of the pie is served chilled. If you’re a regular reader of The Farmer’s Lamp, then you know all my ingredients are organic, non-GMO. If you don’t follow this way of living, then use the ingredients you’re used to. If you haven’t had organic, non-GMO coconut cream pie, then you won’t notice the difference. 2) Separate the eggs and put the whites in the refrigerator to keep cool. I use them to make my meringue. 3) Beat egg yolks well in a small bowl. 4) In a 2 quart pot, combine sugar, cornstarch, and salt. Gradually stir in the milk combining well. 6) After boiling for 1 minute, slowly stir ¾ of the hot mixture into your egg yolks. Then immediately stir the egg mixture back into the pot with the rest of your pie filling. 7) Return the pie filling to a boil over medium heat. Let boil for 1 minute and remove from heat. 8) Add butter, coconut, and vanilla to the pot and combine well. 9) Pour your filling into your prepared pie crust. Press parchment paper (plastic wrap if you don’t use parchment paper) onto the top of your pie. This will stop a skin forming on the pie. Let the pie sit on the counter to set for a couple of hours and serve warm. A warm pie filling will be runnier than a cold set pie. Cover as above and refrigerate for at least 2 hours or until the pie filling is set well. Once you have your pie filling poured into the pan, beat the egg whites until fluffy. Gradually add 5 tablespoons of sugar to the egg whites while continuously beating on high speed of your mixer or as fast as you can by hand. Hand whipping takes forever and I can’t seem to do it sufficiently this way like Granny could. Refrigerate for at least 2 hours or until the pie filling is set well. I think I’m going to go make one now! I like this pie almost as much as I like Ma Horton’s Velvety Chocolate Pie. 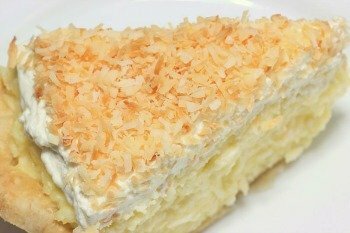 Do you have a favorite Old-Fashioned Coconut Cream Pie recipe? 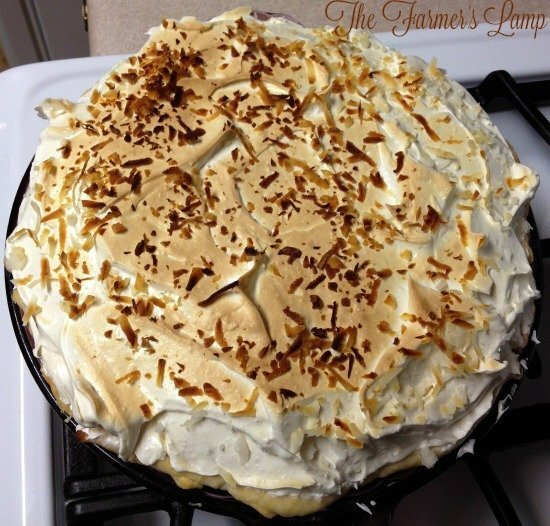 How about cooking tips for a coconut cream pie?